High Quality Content by WIKIPEDIA articles! 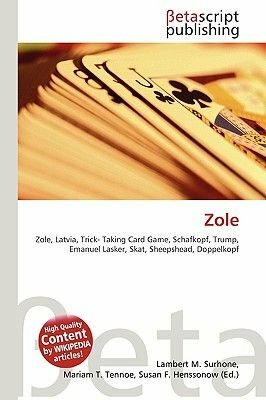 Zole (diminutive Zolte) is a Latvian national trick-taking cooperative card game for 3 to 5 players. The game belongs to Schafkopf group of Ace-Ten card games, t.i. Jacks and Queens are permanent trumps in the game. Zole is played by only 26 cards of 32-card piquet deck or French-style deck, consisting of 36 cards. Six or ten cards are removed from the deck and left out of play. Official rules and terminology were published by Latvian Zole Game Federation (LZSF) in 1996.The game's name derived from the Latvian language word (Latvian: zole), meaning foot.Some sources give other ethymology of the name, in their opinion the word Zole descend from solo. For the first time Zole rules were published in Emanuel Lasker's book under the name Skat Rvelts and probably have Estonian origin.